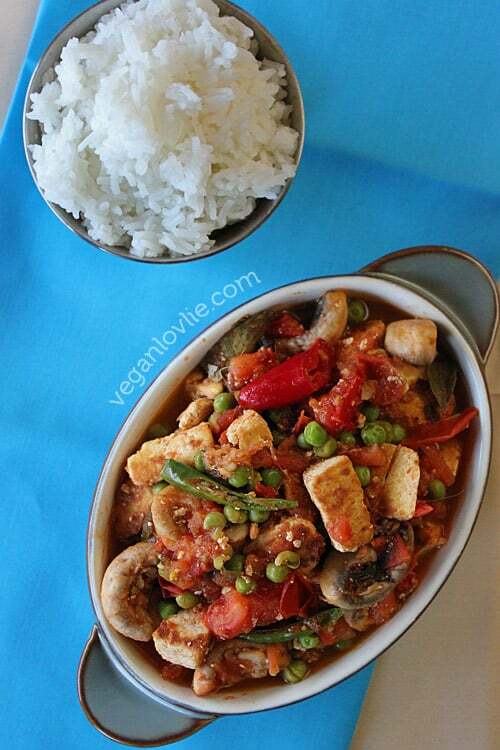 This Tofu and Mushroom Rougaille or rougail is a vegan version of the Mauritian Creole-style tomato based sauce with aromatic herbs like thyme, parsley and coriander. “What’s Mauritian cuisine like?”, this is a question that I get quite often when I come across people from other countries. Well, Mauritian cuisine is primarily an exotic mix. All continents gather to offer a myriad of colours and flavours. Infact it is more than common for a combination of cuisines to form part of the same meal. Mauritius, by default, is composed of a mix of cultures and races that came from mainly Africa, Asia and Europe. A little bit of history would take us back to the days of slavery (the years preceding 1835) when the first African slaves were brought to the island, by the English and French, to work in the fields. Later, after the abolition of slavery, indentured labourers were brought from India. Then, some Chinese migrants came as well and opened businesses. Nowadays, we have a mix of all these races and cultures along with a few Europeans. The best thing about this mix is undoubtedly the rich food culture! 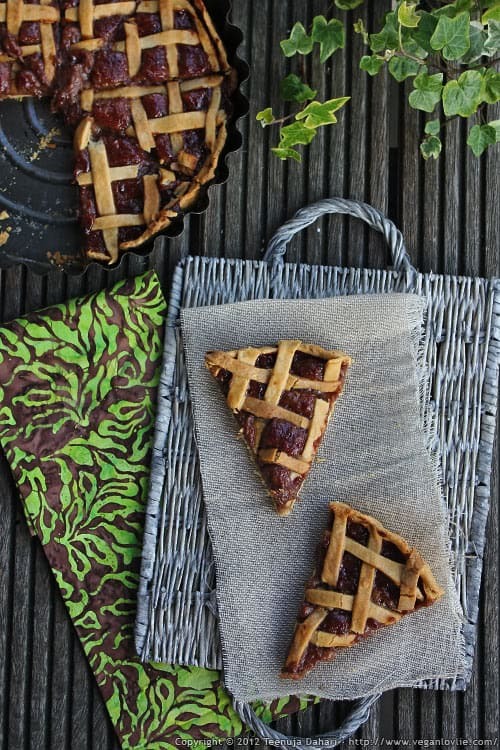 Over the years, the cuisines from these different continents have adapted to give the Mauritian cuisine its picturesque aspect and authenticity while still keeping some of their vivid origins. From the French patisserie and other delicacies to the Indian curries without forgetting the ever so popular Chinese noodle, rice and dumpling dishes and tasty African dishes. Many other Mauritian dishes have been featured on this blog before, although as you may have noticed already, I do not exclusively write about Mauritian food. Well, quite simply because I love food, and for everything new and that seems attractive, I will give it a try or two, then adopt or adapt! Today, I’m presenting the Mauritian Rougail (or Rougaille, pronounced ‘roo-guy’). The rougail is undoubtedly a dish that wins the heart of every Mauritian and is sure to win yours too! 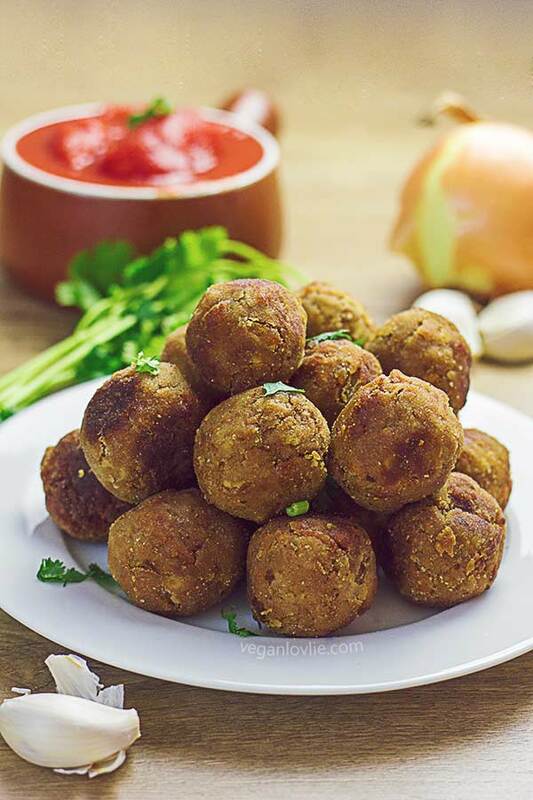 A Creole-style tomato based sauce with the common addition of sausages, fish and other meat, the rougail also presents itself in a popular vegetarian version too (which happens to be vegan). 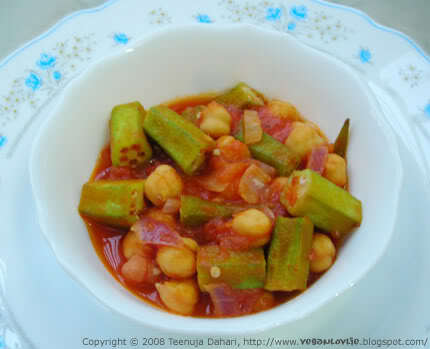 The vegetarian version is locally called “rougail touni”, literally translated as “naked rougail”. Naked because nothing else is added to the base which basically consists of tomatoes, garlic, onions, ginger and fresh herbs. Then some people like to add their own twist to it like peas and different herbs and other spices. While the origin of this dish is not exactly known, variations of it can also be found in Reunion island (which is a French island, neighbour to Mauritius), where they make a raw fruity green mango rougail and in Madagascar where they also make a delicious raw version used as a condiment. The Mauritian rougail however, is a cooked dish and the best part is that it is ridiculously easy and quick to make and does not require a long list of ingredients. Most ingredients would be staples in your kitchen I would think. The plain “naked” version is made in less than 20 minutes (including preparation time), quicker that it took me to write up this post and the recipe! The rougaille is commonly served over rice or with bread but a lot of Mauritians (including myself) enjoy it over plain boiled noodles as well. And there you have a great combination of different cuisines as part of the same meal! One more thing, since I personally have reduced the consumption of onions and garlic for probably almost a year now, I have adapted the recipe for myself without them. However, I have included onions and garlic in this recipe as I used to make it before, to keep the authentic version. I’ve also used tofu in this one but really anything can be added to the tomato base: beans, veggies or even some coarsely crumbled dal chilli cakes! Video for Red Kidney Beans and Mushrooms Rougaille. Heat 1 tablespoon oil in a non-stick pan. (I find a 28-cm wok style pan works best for this). Add the tofu pieces and pan fry until golden and slightly crispy. Meanwhile, cut tomatoes into rather chunky wedges or cubes. Depending on your heat tolerance, you can either slice the chillies in half lengthwise or leave them whole. In the same pan, heat 1 teaspoon oil. Add onions (if using), garlic (if using) and ginger. Saute for 1 minute. Add curry leaves and chillies. Toss and saute for a few more minutes. Stir and simmer for 5 – 7 minutes or until tomatoes have started to form a lightly creamy sauce. Add a little water if required. Then add mushrooms and tofu pieces. Add frozen peas. Add salt and pepper to taste. 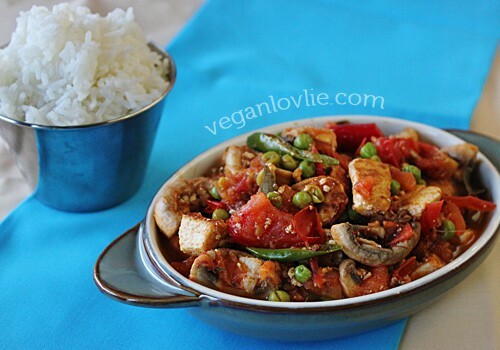 Stir and cook for a few more minutes until mushrooms are cooked and tofu have absorbed a bit of the tomato juice. At this point you can decide to add a little water and simmer to make up some sauce or leave it somewhat dry (as in the photo). Variation: I like to leave the tomatoes somewhat chunky so I don’t actually allow it to completely become a sauce but some people do make more sauce and in this case you can add more tomatoes and simmer for longer. Serve over basmati rice or plain boiled noodles. Bon appétit! A vegan version of the Creole-style tomato based sauce with aromatic herbs like thyme, parsley and coriander. 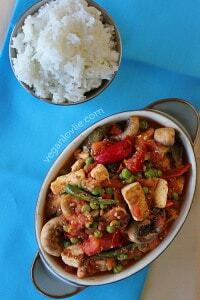 Tofu and mushroom rougail. 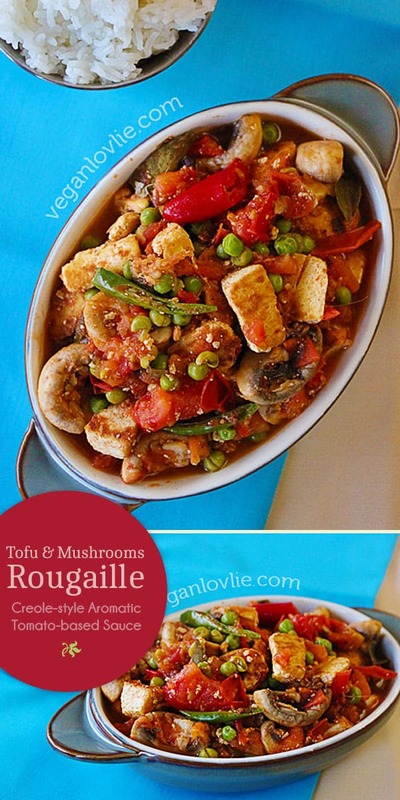 Love this Mauritian Rougaille recipe? Pin it for later. Oooh, I like the chunky tomatoes too. I was thinking fusion also, but Veganosaurus beat me to it. Whatever you call it, it looks delicious and something I&#39;d like to add to my repertoire.